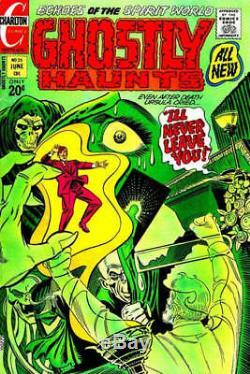 GHOSTLY HAUNTS #25 COVER (1971). Media Type: Pencil and Ink. Artist(s): Steve Ditko (pencils & inks). 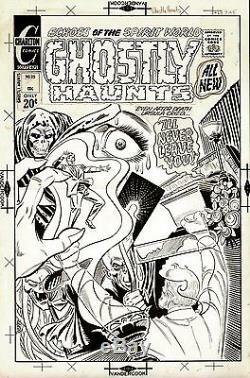 Check out this wonderful 1971 LARGE ART HORROR cover which was penciled AND INKED by the masterful hands of STEVE DITKO! This sweet cover has a large actual drawn art image measuring 12.5 by 19 inches on a much larger art board! This awesome cover montage features heaps of horrific havoc by the great Steve Ditko. Only the hall of fame comic book artist Steve Ditko could conceive of such a bold and innovative cover montage design for this eerie issue of Ghostly Haunts, with a cloaked skeleton, an evil man holding a knife, a ghost screaming out, a dead woman screaming I'LL NEVER LEAVE YOU! From her casket, A frightened face with tears streaming down, a crazy angled door which looks like the TWILIGHT ZONE opening sequence, and a crazy fanged monster face! One small problem with this cover is that there is a horizontal crease which goes through the exact center of the cover as a lot of Charlton covers were folded in half back in the day, but no artwork is missing and the crease is not that evident on the front but it is seen on the back. Don't miss out on this VERY affordable 1971 Steve Ditko penciled AND inked LARGE ART cover if you can help it, as this will be 1 of the most AFFORDABLE "LARGE ART" ALL Ditko drawn covers you will EVER have the opportunity to own! Compare this nice cover art to the published comic book! The item "Ditko, Steve GHOSTLY HAUNTS 25 COVER Large Original Art (1971) CLASSIC HORROR" is in sale since Wednesday, May 14, 2014. This item is in the category "Collectibles\Comics\Original Comic Art\Covers". The seller is "romitaman" and is located in Ravenna, Ohio. This item can be shipped worldwide.